There is something completely intoxicating about the smell of peaches in the summertime. Get within 10 feet of them and try not to get weak in the knees. This fragrant fruit is one of my favorites so you could imagine my excitement when I saw organic peaches on sale for 92 cents a pound yesterday. I was at my “bargain” supermarket mind you, but I can almost guarantee that you won’t find peaches this cheap outside of Georgia…unless they are about to rot. See, I have different stores for different shopping occasions. One for meat and produce, one for seafood and one for all the non-organic necessities. This method is key for a frugal foodie like myself. I value quality, but I can also see through the marketing BS that specialty stores try and sell you on. Things like flour, eggs and butter are like mascara to me. I refuse to spend $89 on a tube of black goo that will always be ranked below good ‘ol Maybelline Great Lash. The same goes for peaches. This dessert was swoon worthy and also super easy. Besides putting the spoon down, the hardest thing about it is slicing the peaches. If you’re peach pit averse like me, maybe you should invest in one of these. I know I am! Preheat oven to 400. Grease an 8×8 baking dish. Combine flour, sugar, salt and baking powder. Add in milk gradually and mix until just combined. Fold in sliced peaches. Add to greased baking dish. For the topping, bring all ingredients to a boil then take off heat. Pour topping mix on top of flour and peach mixture. Bake for 45 minutes, let cool before serving. 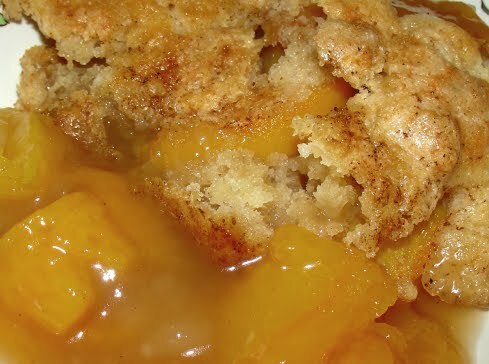 Peach Cobbler is my favorite one! Warm with a scoop of ice cream! This recipe sounds great! !